What If Sazae Was a Modern-day High Schooler? 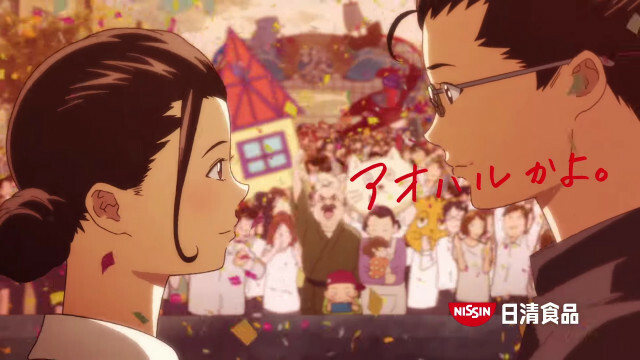 Nissin has released a third commercial as part of the 2017 “Youth” advertising campaign for their “Cup Noodle” product. This one features the titular character from the classic Japanese comic strip Sazae-san (and the cartoon based thereof), which was created by Machiko Hasegawa way back in 1946. Ms Hasegawa is known for being the first female professional comic artist in Japan. Admittedly, I don’t know very much about Sazae-san, other than the fact that it’s incredibly popular, particularly the cartoon. Although the comic wrapped up decades ago, and Ms Hasegawa herself passed away in 1992, the animated version is still going strong. In fact, according to Wikipedia, it holds the record for the longest running cartoon in the world (1969 – present). Sazae-san is basically a slice-of-life series, similar I suppose to western sitcoms. It centres around the family life of Sazae, a young but independently-minded housewife in post-war Japan. In this commercial, however, Sazae is of course re-imagined as a modern-day high-schooler, as is her future husband, Masuo. Like the other two commercials, this one comes in both 30 second and 15 second versions. You can check out the 15 second version below. This entry was posted in Food, Japanese Commercials and tagged Cup Noodle, Machiko Hasegawa, Masuo, Nissin, Sazae, Sazae-san by maruserino. Bookmark the permalink.